"The traditional origin of the arms (which is probably of as much value as other traditions of the same kind) is that David, Earl of Huntington, brother of King William of the Lion,2 when on his way home from the Holy Land3 was shipwrecked at Bervie Brae, and on gaining the shore was attacked and wounded by a ferocious wild boar. He would have been killed had it not been for the intervention of the progenitor of the Allardice family, to whom the King, in gratitude, granted the lands of Allardice, then called Alredies, and the arms. 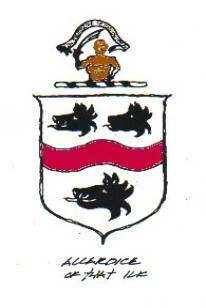 Hence the armed man for the crest, the motto 'In defence of the distressed,' the boars' heads and the fess wavy gules,4 representing a wave of the sea tinged with the blood of the boar. The supporters (not registered) are a boar pig and an eagle." 1 The Genealogical Magazine, vol. 3, pp. 269-270 (1899). 2 David, Earl of Huntington (1145-1219), the brother of King William I (1143-1214) the Lion. 3 David did participate in the Third Crusade (1187-1192). He is the hero of Sir Walter Scott's novel, The Talisman. The shipwreck, if it occurred at all, would have been about the time of the first charter granted to the Allardice family. 4 The fess wavy gules is not a common charge in Scottish heraldry. The boars head, however, is very common among Scottish families in Northeast Scotland; notably, the Gordons and the Forbes, two families that intermarried with the barons of Allardice. The crest of the Allardice family features a naked man holding a scimitar, a sword used by the Saracen armies fighting in the Third Crusade, which lends further credence to the family tradition.